Coralita Shumaker was attending a workshop four years ago when the seed of a dream was planted. Homeownership, it turned out, might be possible for the 32-year-old Dubuque woman too. Shumaker, who rented a three-bedroom apartment, was at a city of Dubuque homebuyer workshop when Dupaco’s Krystal Frederick discussed the ins and outs of mortgages. Now Shumaker has just that, thanks in part to Dupaco’s MoneyMatch program, in which the savings of a participant are matched by a grant from the Dupaco R.W. Hoefer Foundation. The savings and matching funds are used to purchase a wealth-building asset, such as a home. With money automatically saved from every paycheck, Shumaker eventually accrued $2,000, with another $2,000 matched by the program. She also qualified for the city’s Washington Neighborhood Homebuyer Loan Program. As Shumaker saved, she also continued to meet with Frederick, who showed her how to drive up her credit score and offered encouragement along the way. 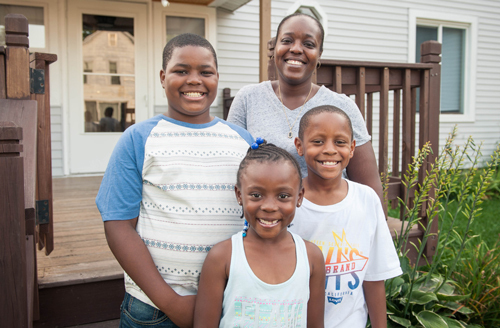 On Aug. 30, Shumaker realized her homeownership dream, buying a move-in-ready, four-bedroom house—providing more space for her family and opening the door to more dreams for the future.